The Bleriot XI made history in 1909 when, under the command of designer/builder Louis Bleriot, it made the first crossing by air of the English Channel. The design of engine and wings in front, with elevator/stabilisers in back, set the recognisable standard for aircraft to this day. Hundreds, maybe thousands, were manufactured all over the world with dozens of variations in powerplant. The type became the first military aircraft (if not the first aircraft of any kind) to fly in most nations around the world, and even saw limited service in the Great War. Several dozen airworthy replicas and reproductions, faithful to varying degrees, have been constructed worldwide. A small number of originals also fly, with one – piloted by Swedish collector Mikael Carlson – set to reenact M. Bleriot’s historic Channel crossing this year for the 100th anniversary of the landmark flight. FROG originally released a Bleriot kit some years ago and I believe this is the same kit, albeit released by a Russian company and with ALL text entirely in Cyrillic! So apologies for the lack of information regarding manufacturer and kit number, but I can’t decipher it! The kit is moulded in a light tan plastic, making it easier for those who don’t relish painting! You can tell the moulds have had a lot of use due to some flash present, as well as a massive amount of ejector pin “towers” on the upper fuselage…..they are so prominent I actually thought they were the mounting lugs! There are also large “towers” on the interior of the lower fuselage. The undercarriage looks to be the fiddliest part of construction, with a multitude of struts to be had for the mains and also the tailwheel – I believe Bleriot’s Channel-conqueror was equipped with a tailskid, so research your intended subject thoroughly. All three wheels are moulded with very thick spokes, so you may like to replace the wheels. Where you could get replacements, though, I have no idea. The wings and horizontal stabiliser are moulded as single-piece parts, thankfully, as they are very thin. All have what appears to be the correct amount of camber moulded in, as well as holes for rigging (the instructions give a three-view diagram with this in place), and what some modellers would probably call “restrained fabric detail” in the form of miniscule, very small bumps here and there. I’ve said it before, and I’ll say it again: on 1:1 aircraft, you can’t see fabric texture unless you’re about six inches away! That’s my experience, anyway. The three cylinder Anzani engine has a fair amount of flash, but looks sufficient for this small scale. The prop, on the other hand, is poorly moulded with no hub detail at all and is almost like that of a paddlesteamer – I seriously recommend replacing it! The fuel tank is one piece and has a prominent equatorial seam, but looks about right. A rectangular box is provided for behind the engine mount, although I have no idea what it represents, and the pilot has a seat and control wheel. A pilot is provided, as well as a standing figure slightly larger than 1:72. It must be Louis Bleriot, judging by the bushy moustache he has! Tweezers will become your best friend during this build, and you will make beautiful music together…..well, perhaps not beautiful to the more religious amongst us…..there really are a lot of small struts even in this relatively simple kit. Thankfully the fuselage has been thoughtfully moulded, with a combined lower/side fuselage, and an upper. The plywood sides of the forward fuse are very smooth, but on mine the underside has some moulding bubbles and the aforementioned ejector pin “towers” inside…as well as “MADE IN USSR”. Za Rodina! I think this, and the other incarnations of it, is the only injection-moulded Bleriot monoplane in 1:72. I may be wrong, but perhaps even in any medium. 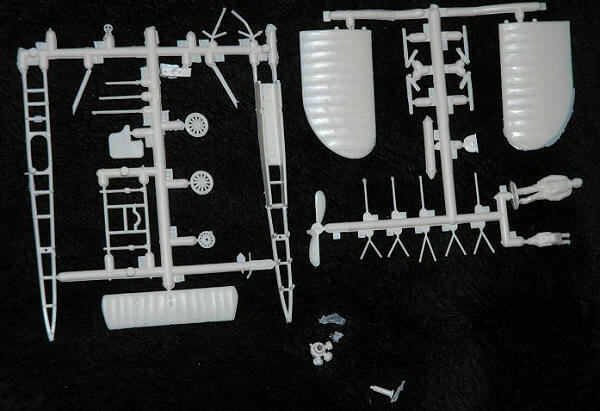 Looking at mine, it appears that given a three-view, spares and sheet styrene, you could probably make your own in about the time it would take to build – and rig – this kit. Despite the time for parts cleanup this copy will need, it will nonetheless be a fairly smooth build, resulting in a fine representation of a very historic type.